Mohammed graduated with an honours degree in LLB Law at the School of Management, University of Bradford. Mohammed was selected to represent the university in external mooting competitions and in 2010 received an award by the Student Law Society for his outstanding performance. Mohammed then undertook the LPC part-time at BPP Leeds whilst working as a Litigation Executive at a Yorkshire based Law Firm. 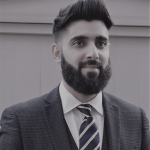 Immediately after his admission to the roll of solicitors, Mohammed obtained his Higher Rights of Audience in civil proceedings and joined Lyons Davidson Solicitors practicing as a Solicitor Advocate. Due to his experience in – house, Mohammed was granted pupillage exemption and subsequently began to practice as a self- employed Barrister. Mohammed has over 6 years’ experience in civil matters with a particular specialism in Personal Injury. Mohmmed regularly acts for both claimants and defendants in a variety of matters such as interlocutory applications, case management conferences, small claims hearings, stage 3 hearings, disposal hearings and fast track matters. Mohammed also has a paper practice alongside his court work where he regularly provides advice on liability and quantum as well as drafting pleadings. Having experience of working in solicitor firms, Mohammed is well-suited to meet the needs of both lay and professional clients. Mohammed enjoys keeping fit by attending the gym and undertakes regular Mauy Thai training. Mohammed also plays cricket at senior club level and has won many championships in the Bradford Mutual Sunday School league. As a trustee of a local charity, Mohammed has a passion in helping others and has been involved in numerous charitable projects both nationally and worldwide. Mohammed has successfully completed Level 1 in British Sign Language in a bid to develop his enthusiasm to converse with the deaf community.